Fans can be brutal when it comes to how they treat opposition team players and not many look eye to eye. But sports sometimes can be a great unifier. One such instance took place when the baseball team Chicago Cubs faced off against the St. Louis Cardinals. 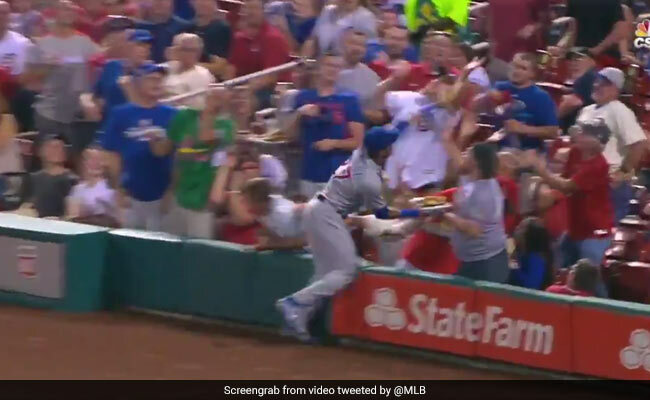 Chasing down a foul ball, Cubs shortstop Addison Russell swan-dived into the stands and ended up knocking over an almost full tray of nachos and cheese out of the hands of a fan. As the ground crew cleared up the mess on the ground, left by the collision, Russell went about wiping quite a bit of cheese off his arms. The Cardinals fan, identified as Andrew Gudermuth, wore a dismayed look after his snack had just taken a tumble. Obviously a little guilty about what had just occurred, Russell showed his class and made up for the accident brilliantly. The player came out of his dugout in the next inning holding a fresh plate of nachos for the Cardinals fan. An absolutely delighted Gudermuth, gleefully accepted the tray of nachos and the appology and not just that, he even managed to get a selfie with the Cubs star.